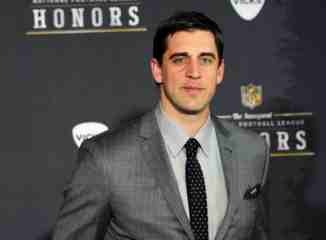 The Packers Aaron Rodgers was honored with The NFL MVP award last night in Indianapolis. The Super Bowl XLV MVP last year, Rodgers won by a landslide over Drew Brees, of the New Orleans Saints. The actual vote was Rodgers 48, Brees 2. Rodgers set a NFL league record 122.5 passer rating, threw for 45 touchdowns passes and only six interceptions. Watch video! Drew Brees was awarded the (offensive player of the year), throwing 46 touchdowns and setting an NFL record 5,476 passing yards. Ravens linebacker Terrell Suggs won (defensive POY), Panthers quarterback Cam Newton (offensive rookie of the year), Broncos linebacker Von Miller (defensive ROY). The Packers kick returner Randall Cobb won Play of the year, with his 108 yard kickoff return, over Bengals wide receiver Jerome Simpson’s acrobatic flip for a touchdown against Arizona “I definitely thought (Simpson’s) flip would win,” Cobb said. Today’s Super Bowl 46 between The New York Giants and New England’s Patriots, will take place today at 6:30PM ET in Indianapolis at Lucas Oil Stadium, and will be broadcast exclusively on NBC.